Apart from condensers and compressors, another essential part of a top performing central air conditioning system is the ductwork installation. When we speak of ductwork, this refers to the air conditioning ducting supplies that one can use for any air conditioning unit. Keep in mind, ducts come in a variety of designs and finding the perfect match should be taken seriously. Below are types of ducts suitable for central air conditioning. Flexible ducts are made from wire coils, usually covered with bendable plastic material and surrounded with insulation. This kind of ducting is used to attach a non-flexible ducting such as sheet metal ducts. Flexible ducts are ideal to any space where rigid ducts cannot be installed. This type of ducting material is easy to install and more affordable than rigid ducts. The only issue that may arise after installation of flexible ductwork is leakage if the installation is done by a less experienced ductwork installer. Sheet metal ducts. This type of ducting material is what you normally see in action movies where the action hero needs to crawl through in order to spy on the bad guys. 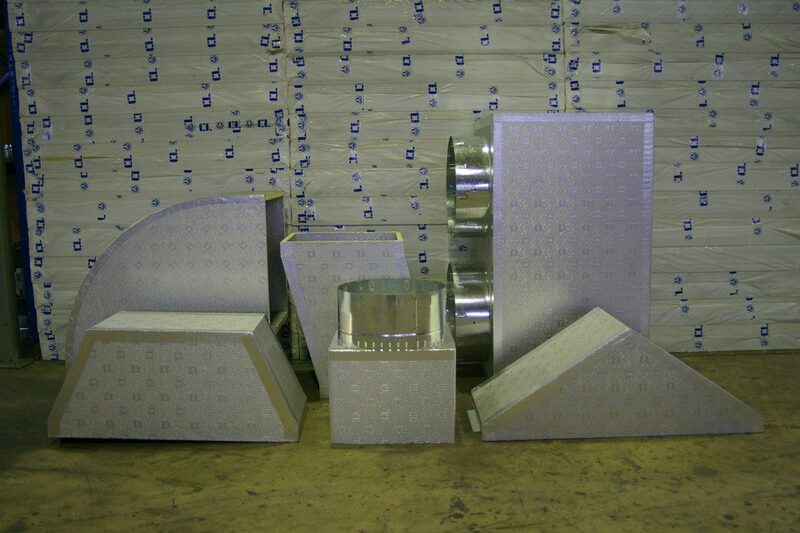 Among the metal used for sheet metal air conditioning ducting supplies are aluminum and galvanized. Aluminum is generally favoured because it’s very light in weight and easy to install. Fiberglass lined ducts. These air conditioning ducting materials are commonly used in commercial offices and buildings. They are sheet metal ducts with internal or external lining of fiberglass. The benefit of this type of ducting is it lessens the sound coming from an air conditioning unit. However, fiberglass has the tendency to deteriorate faster if compared with other ducting materials. Aside from that, fiberglass ducts in the long run can be contaminated with molds and bacteria, making it a major concern on one’s health. Duct board. Duct board is regarded as the simplest ducting material insulated with fiberglass, plus the outer covering is either foil or fabric. This type of ducting is prone to damage and dust accumulation, but very efficient in cooling and heating due to its good insulation feature. Overall, rigid ducts are durable and reliable for any air conditioning installation, but may cost more than flexible ducts. However, if you are looking for a quick installation, flexible ducts could be the right air conditioning ducting materials. Who to contact before buying air conditioning ducting supplies in Australia? If you find it hard choosing from a wide range of air conditioning supplies for your central air conditioning contact a ductwork installation expert and discover the best ducting material suited for your home or office. In case you are looking for air grilles in Australia or wish to seek professional advice regarding a tailored air conditioning system, feel free to contact the representative of AirTag, a reputable distributor of air conditioning and insulation products in Australia.